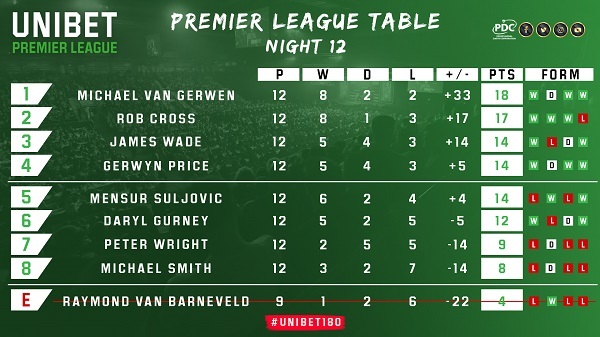 Michael van Gerwen headed to the top of the Unibet Premier League after an 8-2 demolition of Rob Cross from Cardiff. 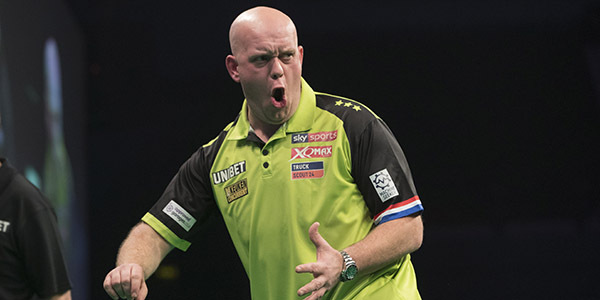 ‘Mighty’ Michael van Gerwen stormed to the top of the Unibet Premier League table with a ruthless 8-2 rout of Rob Cross at Cardiff’s Motorpoint Arena. Reigning champion Van Gerwen trailed Cross by a point going into their top-of-the-table encounter, and found himself 2-0 down as the world number two made the brighter start. Cross then missed tops for a 125 finish in a key third leg, allowing Van Gerwen in for a 13-darter to get off the mark as he reeled off eight straight legs. Those legs included a 12-darter which featured scores of 180 and 174 to set up a 90 finish and only one which needed more than 15 darts in a brutal run as he averaged 108. 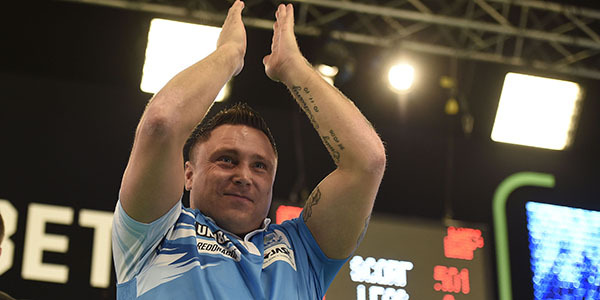 Gerwyn Price delighted his home crowd with an 8-5 win over Michael Smith which leaves the 2018 finalist six points adrift of the top four. Smith defied the vocal Welsh support to power home a 170 finish in leg three as he edged 2-1 up, only to see Price match that with the maximum checkout in the fourth as he levelled in style. The pair shared the opening eight legs before a stunning ninth saw both players land two 180s, with Price’s seven perfect darts helping him break to move 5-4 up. He extended that lead to 7-4 before Smith kept his hopes alive with a 70 checkout, but tops saw Price seal a fifth win of the campaign to strengthen his Play-Off challenge. Mensur Suljovic boosted his Play-Off hopes and returned to winning ways with an 8-5 defeat of Daryl Gurney, denting the Northern Irish star’s top-four chances in a key battle. A tight contest saw the opening six legs shared, before two breaks of throw in three legs for Suljovic saw him pull clear at 5-3 and 7-4. Gurney finished 68 to hit back, but double eight for Suljovic sealed his sixth win of the season. James Wade continued his great form with an 8-2 resounding win over Peter Wright in the final game of the evening.